A British law firm representing 4,000 victims of a toxic waste incident in Ivory Coast says it will not halt its group action against a Dutch company. On Tuesday, Trafigura said it would pay $198m (£102m) to the Ivorian government for a clean-up and an inquiry. Trafigura director Claude Dauphin and two other businessman, who were arrested and jailed, have been freed. 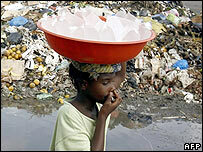 Ten people died and many fell ill after waste was shipped to Abidjan and left around the city in August 2006. In a statement, Mr Dauphin said: "We went to Ivory Coast on a mission to help the people of Abidjan, and to find ourselves arrested in jail as a result has been a terrible ordeal." Jean-Pierre Valentini, also a Trafigura executive, and Kablan N'Zi, a representative of a Trafigura subsidiary, Puma Energy, were also freed. Greenpeace, however, criticised the agreement and expressed concerns over whether the truth would be made known to the public. It said: "This pact with the devil certainly has the advantage of providing the funds to Ivory Coast to pay for expensive clean up operations, but it prevents full light to be shed on what happened." The oil trading company say the agreement is not "damages" and that there is no admission of liability on their part for whatever happened. As part of the deal, the Ivory Coast will drop any prosecutions or claims, now or in the future, against the firm. "It's a good agreement that will allow the state to compensate the victims," Ivory Coast President Laurent Gbagbo told journalists late on Tuesday. But some victims told the BBC they were sure they would receive no money at all, alleging that the government would steal it. British law firm Leigh Day & Co says it will continue its case. "We're going to carry on until our clients are properly compensated and fully compensated for all the losses that they have suffered," says Sapna Malik. "If they receive some form of interim payment from the settlement in the deal that's been struck with the president, that's all well and good, but until they receive full compensation for the harm, we're going to carry on." Thousands suffered diarrhoea, vomiting, breathing problems and nosebleeds and 10 died, say Ivorian health officials. After announcing the clean-up settlement Eric de Turckheim, a Trafigura director, said: "Both the Ivorian government and Trafigura can now move forward together to act in the best interests of the people of Abidjan." He said Trafigura would continue doing business in the Ivory Coast. Trafigura first attempted to discharge the chemical slops from one of its tankers, the Probo Koala, in the Dutch port of Amsterdam in early August. But the company that was to dispose of the waste suddenly increased its charges dramatically - asking for more to treat the waste. Trafigura refused, and the tanker proceeded to Nigeria. On 19 August the waste was discharged near Abidjan, the commercial capital. Two weeks later the first complaints arose. Instead of being incinerated as it should have been, the waste had been dumped. Trafigura said it had been given to a local accredited company in Abidjan's main port to deal with properly.